The candidates first talked live on the phone. 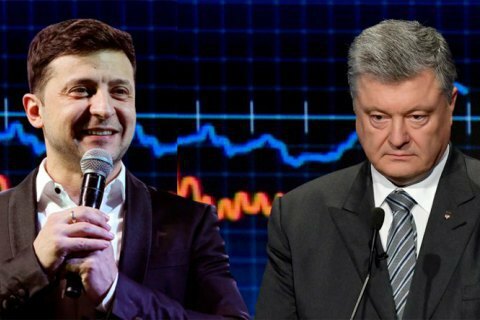 President Petro Poroshenko and showman Volodymyr Zelenskyy, who will meet in the runoff of the presidential election on 21 April, have for the first time spoken to each other on the air by phone. In particular, they discussed a future debate. Poroshenko came to the studio of One Plus One TV owned by media tycoon Ihor Kolomoyskyy, who is believed to be supportive of Zelenskyy, on the evening of 11 April. Poroshenko offered Zelenskyy to come to the studio as well, after which Zelenskyy called in by phone and said he was in France. “Petro Oleksiyovych knows perfectly well that I am now in Paris, in France, because his beautiful cars of the Security Service of Ukraine accompanied me there, to the airport. I have a meeting at 3 p.m. with the president of France tomorrow. Therefore, Mr. Poroshenko knows that I am not in Kyiv and it is very strange that respected presidential candidate Petro Oleksiyovych invites me to the One Plus One studio," Zelenskyy said. He also noted that he had invited Poroshenko to the debate at the Olympic Stadium on 19 April. “He said 'let it be the stadium' and accepted these conditions. I asked him to call me Volodymyr Oleksandrovych or Volodymyr, not 'yob', not 'drug addict', etc. But let's say it still continues a little, but that's okay because we are simple people, we can accept it. Therefore, I invite you to the debate at the Olympic Stadium on 19 April with great joy," Zelenskyy emphasized. Zelenskyy: Petro Oleksiyovych, once again, there will be a debate at the Olympic Stadium on the 19th. If you want it to be held now, it will be now, but I invite you [to the stadium] on the 19th. Zelenskyy: I will finish in five years, and you will finish on 22 April. Zelenskyy: Do you want me to say it again? Do you need me to repeat? Poroshenko: Are you done or not? Zelenskyy: Should I tell you for the third time now? Poroshenko: Are we having problems with signal? Volodymyr Oleksandrovych, I have listened to your statement and now I will speak, have you heard me? Zelenskyy: I have a pleasure to invite you to the Olympic Stadium on 19 April. I have no problems with signal. Poroshenko: Signal is the only excuse. Are you finished, ready to listen to me? Poroshenko: Thank God, the connection is restored. Volodymyr Oleksandrovych, I am not interested in your movements, this is your private or state business. After that, Zelenskyy interrupted Poroshenko, saying that no-one would put his “team in the position”, and hung up. The idea to hold a debate at the stadium belongs to Zelenskyy. Poroshenko accepted the challenge. After this, Zelenskyy has started to avoid holding a debate.